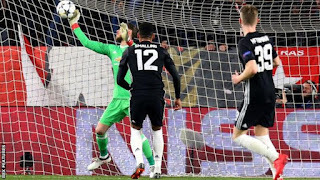 David de Gea's stunning first-half save helped Manchester United claim a creditable draw at Sevilla in the first leg of their Champions League last-16 tie. The Spain keeper had kept out efforts from Joaquin Correa and Steven N'Zonzi before showing quick reflexes to produce a one-handed save on the stroke of half-time and deny Luis Muriel's header. 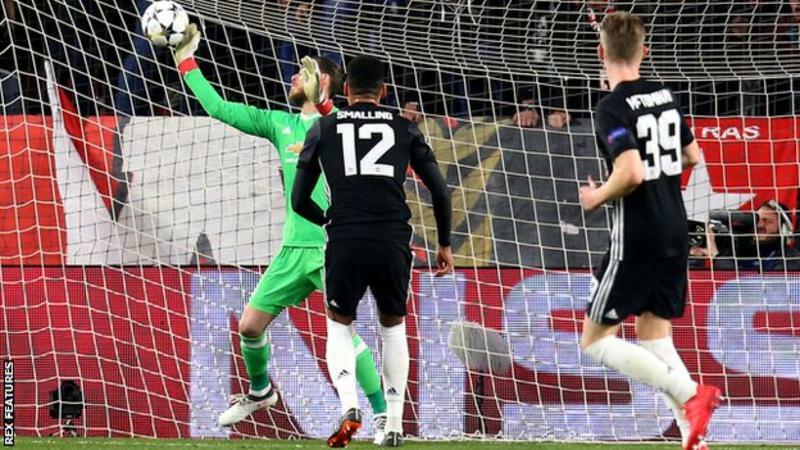 United, who were playing their first Champions League knockout game in four years, offered little offensively, with Romelu Lukaku spurning their best chance when he volleyed well over early on before substitute Marcus Rashford dragged a shot wide in the closing stages. Paul Pogba started on the bench for the visitors, but came on after just 17 minutes following an injury to Ander Herrera. Sevilla finished the game with 25 attempts on goal but a mixture of De Gea's saves and poor finishing from the hosts left them frustrated at the final whistle. Manchester United will be the happier of the two teams heading into the return leg at Old Trafford on Tuesday, 13 March with Jose Mourinho's side winning 15 of their 18 games on home soil this season. VIDEO: Wande Coal & Leriq – Will You Be Mine?? See Who Bisola Aiyeola Is Engaged To?